Autumn is arguably the most beautiful season of the year, a time when the cool afternoon breeze is a welcome change after the sweltering heat of July and August. In the distance, the rustle of vibrant-coloured leaves creates an ever-changing canvas which has an almost surreal effect on my wife Jacquie and I. For a moment, I though time might be standing still as we sat watching our children rake leaves into an enormous pile only to cannonball into the middle and resurface grinning from ear-to-ear. It’s beautiful here and the change of season always reminds us of yet another opportunity to gather with friends and family. Depending on which side of the Canada/U.S. border you live on, the Thanksgiving holiday represents a slightly different meaning. Americans celebrate on the fourth Thursday of November in remembrance of the Pilgrims. In Canada, the second Monday in October marks the traditional close of the harvest. And while the date and historical significance may differ between our two countries, I think all will agree that Thanksgiving is a time to gather around the table with family, to enjoy each other’s company, and to share a wonderful meal with a few good bottles of wine. With that, I'd like to make a few suggestions to enhance your enjoyment of the occasion. The customary Thanksgiving dishes are turkey, ham or both, and that opens a wealth of opportunity for pairing wine with the meal. But let’s uncork and pour much earlier in the day shall we – perhaps just after your guests arrive – a glass of Champagne anyone? In our house, things get quite busy and Jac likes complete control of the kitchen; a place that sadly, I am not welcome on Thanksgiving, Christmas, Easter, or any other holiday for that matter… Rather, if weather conditions permit, we head outside for a stroll through the gardens where sparkling wine and the crisp autumn air is a match made in heaven. Unfortunately though, many people still reserve Champagne for New Year’s Eve festivities and deny themselves of its pleasures otherwise. Thanksgiving is the perfect opportunity to pop a cork and raise a glass of bubbly. In terms of food and wine pairing at the dinner table, I think we are all familiar with the cliché: red with beef and white with fish and poultry but it’s only a guideline, at best. Instead, consider matching the wine with the intensity of the meal. 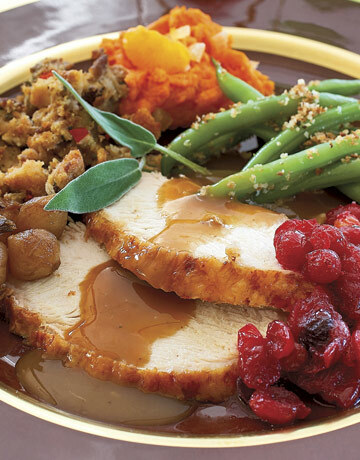 While the turkey itself is quite mild, Thanksgiving dinner is a smorgasbord of flavour intensities: stuffing, gravy, and the many side dishes can be quite rich by comparison. Consider a wine to match these intense flavours such as Shiraz, Riesling, or new world Chardonnay. On the softer side, choose a Pinot Noir or lightly oaked Chardonnay from Burgundy. With the ham, again consider the overall preparation: is the meat glazed with sweet flavours such as brown sugar, honey, or apricots, or will it have a tangy zest such as Dijon mustard? The wine should compliment this element of the dish. Sweet flavours call for an off-dry Riesling or light-bodied Gamay, whereas the mustard glaze combined with the saltiness of the meat works nicely with Ripasso, Gewürztraminer, and Pinot Noir. If serving a salad, rather than vinaigrette, which will clash with every wine, consider creating a dressing using the wine itself as a base. The two textures will compliment each other beautifully. And what is a feast without dessert? If you do elect to serve a dessert wine, do so prior to tea and coffee and remember that it must be at least as sweet as the dish. Consider something fortified such as Maderia, Sherry, or 20-year Tawny Port. You could also keep it seasonal and enjoy a well-chilled bottle of cranberry/maple syrup wine; a combination like no other! A final word on the subject of temperature: No single factor is more important to the overall enjoyment of your wine than its temperature. With the oven and stove running all day, the kitchen may be the warmest room in the house. Consider storing your bottles elsewhere and never rapidly chill your wine in the freezer. Instead, a bucket of ice water will cool these bottles quickly and evenly. Serve sparkling wine well chilled at approximately 6ºC and red wine at between 16 and 18ºC. Keep your whites chilled at around 10-12ºC. Fortified wine is traditionally served on the cool side though personally, I prefer mine at room temperature. With autumn and all its splendour rapidly approaching, I hope that you do take the time to enjoy the season with family and friends. If you decide to serve a few nice bottles, please take an extra moment or two and set the tone for a perfect day. 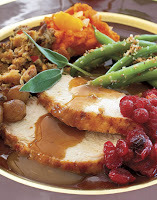 Thanksgiving -- the best season of the year! In keeping with tradition, it’s to celebrate surviving a year in the new world. Children look forward to that because they’ll be able to eat their favorite foods. I agree with you, I will most definitely enjoy a glass of bubbly on Thanksgiving. I mean, who wouldn’t?